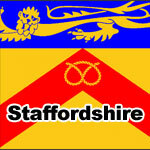 Posts about the Derbyshire Gregory & Clayton family Genealogy. I was at the Derbyshire County Archives today. I was looking for any records of black servants in Derby between 1700 and 1800. 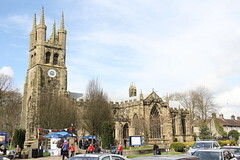 I started looking at the records for “All Saints” (Derby Cathedral). During my search I found one or two interesting burials. Well, I say Interesting, but I guess only if you enjoy history. If you do, here they are. October 7th: Henry Joyce killed in a quarrel by a Butcher. name Yeomans, and she owned (sic)on her death bed. May 4th: A stranger. Name unknown, a woman. April: Buried Henry alsop an infant that escaped the fire. Bottom of Abby Bonny. Buried Hannah Golling in her hundredth year. I also noted that a Smallpox outbreak killed several infants in this parish this year. Over the years the parish saw a few priests but I was particularly struck by the beautiful handwriting. The words were exquisitely written and writing a whole sentence must have taken several minutes as each and every letter seemed to have been lovingly crafted. Some of you may remember that I found out some interesting stuff about Merman House in Tideswell. For those of you who do not remember, a relative of mine, Ben Gregory won a large sum of money by betting on horse called ‘Merman’. He used the winnings to build Merman House. A former occupier of the house contacted me and told me that the Horse belonged to the famous actress of the day. 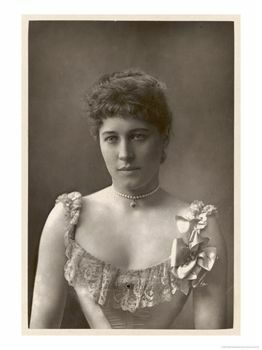 Actress, Lily Langtree. 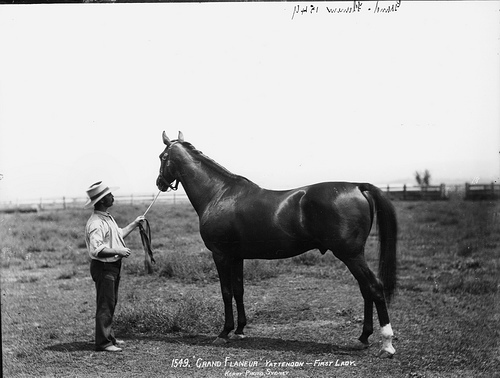 Apparently this horse was RED HOT and won a hell of a lot of money for a lot of people. I found some old articles about it in the “New York Times“. I first wrote this post in 2009, and it’s taken me four years to find an image of Merman. 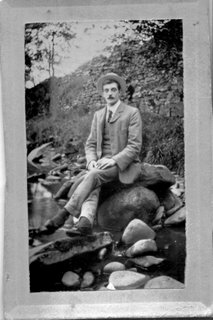 Previously, I had only been able to locate a photo of Merman’s Father, ‘Grand Flaneur’. built by the older Brother of my Great Grandfather. Edwin Gregory was my Grandfather. My fathers father. He was fit as fiddle well into his eighties, or always seemed it. 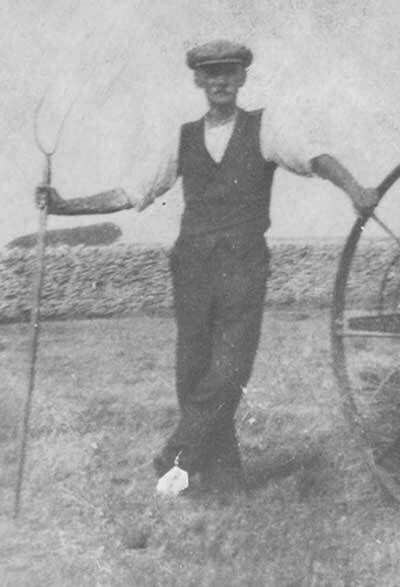 He could walk at a blistering pace and used to walk up “Town Head” to tend his plot of land. I know little of his early life, save to say he had some mechanical skills. When I was a boy he would produce amazing Steam Engines from discarded pieces of junk. I mean, these things actually worked, they had boilers and chimneys, drive belts, wheels etc. They took real fuel. Sadly, I don’t have any pictures of one of these devices, but I’ll endeavour to get one. Anyway, I took this photo myself when I was just a small boy. For a while it hung in my grandparents house, as everyone was so proud of it. I had certainly never taken such a good photo before, and hardly ever since. I never seemed to have a copy though for whatever reason, then when my Grandparents had died, I got to thinking about it. As it was the only decent photo we ever had of Granddad. I later found out my Aunt had a copy of the photo, but although I borrowed numerous family photos from her, this one got over looked. There are quite a few folk in our extended family who are interested in the Gregory family tree, and when I went back to Tideswell this summer, I called in on my cousin Jonathan Buttle. He had this photograph and kindly made me a copy. Now My parents have a copy, and I have one, soon to hanging on the wall. I’m sharing it with you now. 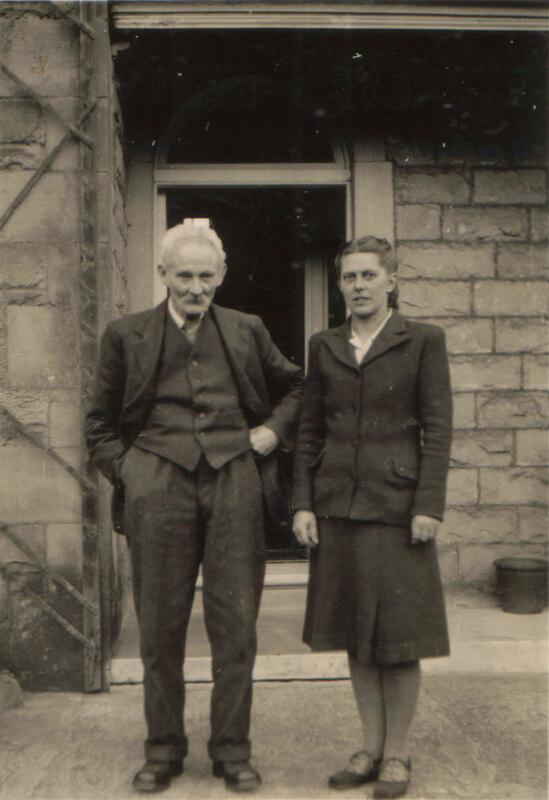 Edwin’s father was Charles Herbert Gregory, his Grandfather was Charles Gregory and his Grandmother Elizabeth Millar. 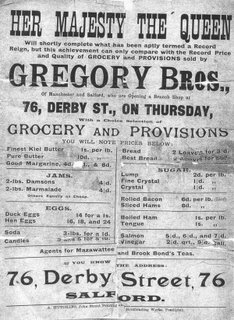 Gregory Brothers Store – Birchinlee, Derbyshire. More gems from my second cousin Malcolm Gregory. 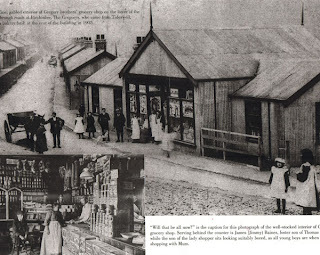 I asked in a letter if Malcolm knew anything about the Gregory brothers owning a shop in the temporary village of Birchinlee, which was constructed to house the workers who worked on the Derwent Dams over Bamford, Derbyshire. No sooner had I asked then Malcolm had kindly sent me this beautiful photo. Serving behind the counter is Nathan Barlow. The boy on the chair is Jimmy Baines. 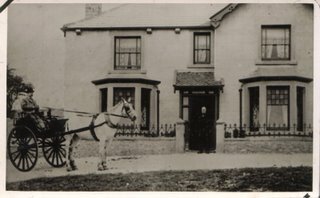 The customer was actually the shops resident housekeeper known as “Granny Bookler” who worked for the Gregory and Hitchen family for many years. 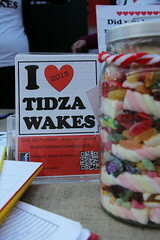 The shop was owned by Thomas Gregory of Tideswell. on polished, marble stone. It reaches out to all who care It is too late to mourn. You did not know that I exist, You died before I was born. Yet each of us are cells of you In flesh, in blood, in bone. Our blood contracts, and beats a pulse Entirely our own. The letter from Malcolm Gregory arrived last night. As I looked through the contents, each item was more exciting than the next. I’ll share the best contents with you here. 1. 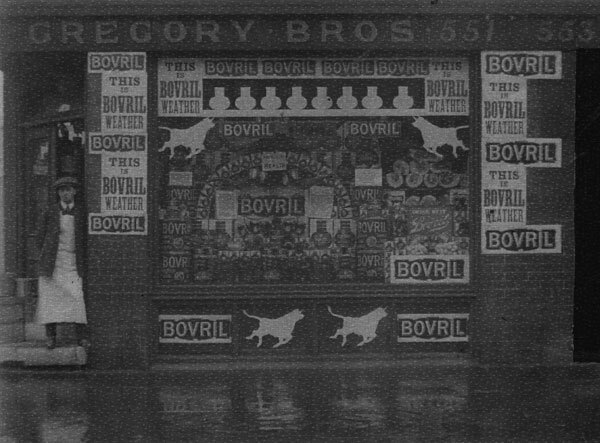 A Photograph of Gregory Brothers shop at Seedley in Salford, Manchester. circa 1900- 1914. The man in the doorway could be Charles Gregory 1890 – 1919. His father Ben owned this shop then. 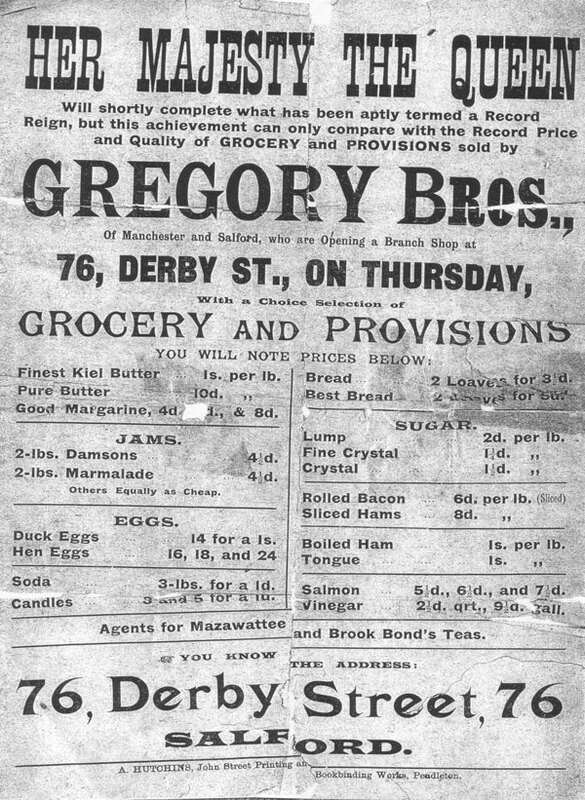 This was the last Gregory Brothers shop, closing in 1937. Ben was a brother of my Great Grandfather Charles Herbert. These flyers talk about the “Record Reign of Queen Victoria. 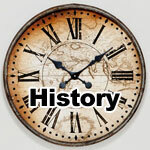 looking in detail the provisions are fairly common place even today. 3. A Page of the Prestbury Parish Registers 1728. 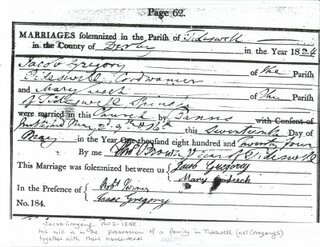 Showing the Marriage of William Gregory of Youlgrave and Hannah Taylour of Wilmslow 1728. 4. 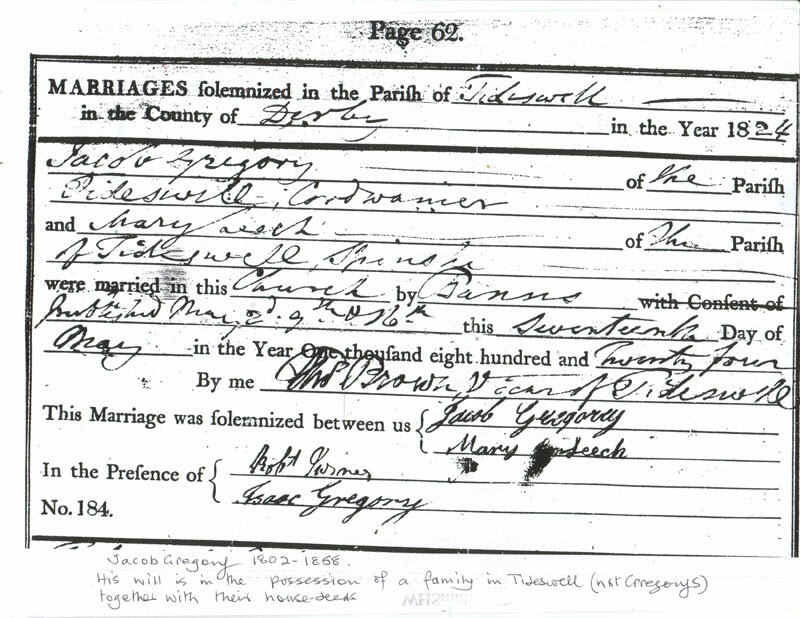 A copy of the Marriage certificate of Jacob Gregory (1802 -1858) and Mary Leech – Both of Tideswell. Muriel, Dorothea, Leslie, Nancy, Charles, Malcolm. Here is my grandfather, Edwin in a nice old car, on what looks like the car park outside the George Hotel, Tideswell. 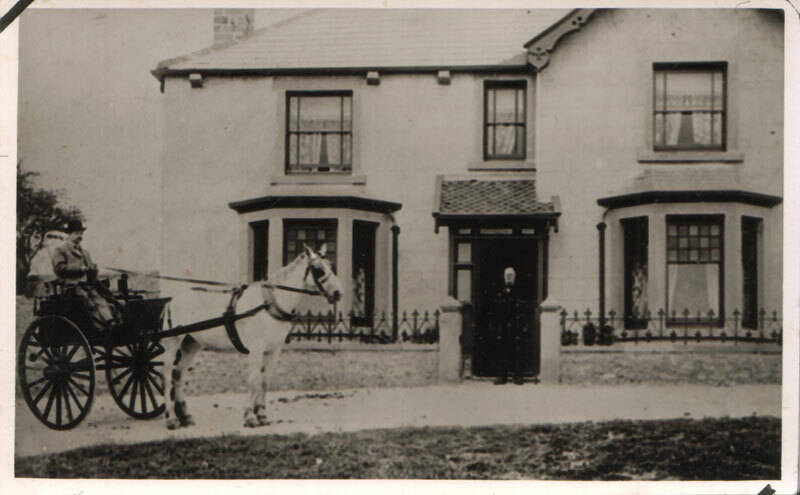 Charles Gregory 1830 – 1903(doorway) and son Ben 1864-1928(cart) outside Merman house,Town Head, Tideswell. Merman House was filled with junk for most of my childhood. I always had a funny feeling when walking past it. Thankfully, today the house is restored to former glories. Charles died in France in hospital. 11th nov 1918. He was the son of Ben. His name appears on the War memorial in Tideswell and I also have a photo of his grave which is shared with his grandparents Charles and Elizabeth. I’m sure there is much more to come. I’ll post any information I get, as I get it. Yesterday I spoke with my Grandad’s first cousin Malcolm Gregory. He was kind enough to phone me following a letter that I had written him asking about any Gregory info that he might have. Malcolm is in his 80’s and remembers a lot of things that no one else can help me with so I feel very lucky to have found him. Thanks to Simon Goodwin for the tip off!. 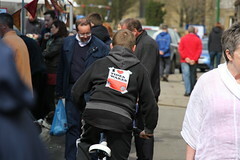 Malcolm doesn’t live in Tideswell but he used to visit quite a lot. He has lots of information to share with me and we have agreed to keep in touch via snail mail. I’m looking forward to the arrival of his first letter. I’ll post any points of info to share with you all. He remembers my Grandad, Edwin and also spoke of Doug Cartledge. This is the Tree of Charles Herbert Gregory b 1872 and his Children. I have not displayed further because C.H’s Grandchildren are still living. I will not be uploading Gedcom files to avoid confusion, but if you want one please email and ask. * I will upload new versions of these files as soon as I can. Here is the first tree I’m posting. It is the Ancestor Tree of My Grandfather Edwin Gregory b.1900, Tideswell, Derbyshire. It goes right back to Jacobus (James) in 1670. Please feel free to download this file and add it to your information. I will not be uploading Gedcom files to avoid confusion, but if you want one please email and ask. Well, after having my initial hunch, being sort of right ( That some of our Gregory’s came from Ashover) I popped up there today. I wandered into the churchyard and started looking at the graves, The Very first grave I came to Was a Gregory one. Typically though there was a wedding just starting so I went and made myself scarce, for a bit and wandered off round the back of the graveyard looking for more Gregory’s. I ask you , what normal 32 year old spends his saturday afternoon wandering round graveyards? It’s morbid, I want looking at! Anyway, I didn’t find any more Gregorys as I was only casually browsing, I did find loads of Allens though, Cousin Mark might be interested in that. Getting back to the Gregory’, I spotted a Grave dedicated to the Gregory’s of Ravens Nest 1600-1938. I thought this must be some replacement stone to commemorate a lot of Gregory Graves no longer standing. Most of the Stones at Ashover are suffering from heavy erosion. I went down to the cake shop and as I was pondering whether to buy carrot cake or mild fruit, I asked the lady proprietor if she knew where Ravens Nest was? 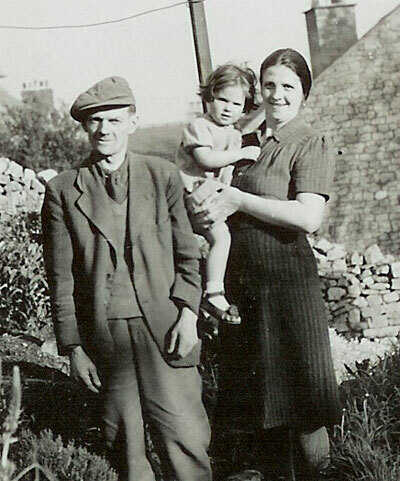 She said that she knew the place as the Ashover Gregorys were Miners and owned Gregory Mine. The good lady listened, to my mini spiel about doing family history, my dad being a Gregory and what not, and pointed me in the right direction. When I drove up there I realised , Wow!!! These lot were minted! I mean Ravens Nest Farm as it stands today is a £800,000 house. It doesnt seem, from What I could see to have any of the original building left, It will now be interesting to see who if any of the Gregorys who lived at Ravens Nest are related to my lot. They had Two more Kids, Annie and John. I Wonder where the descendants of the Gregory’s are now? 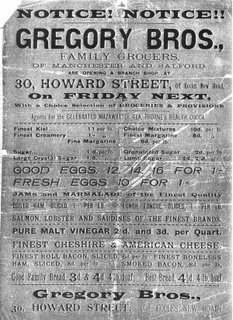 1881 isn’t that long ago, should be able to find these with ease. Famous Last words. This is the last Will and Testament of me William gregory of Mill House in the parish of Youlgreave and County of Derby, Yeoman, and First I will direct and appoint that all my just Debts Legacys and Funeral Expences shall be paid by my Executors hereafter named out of my personal Estate. 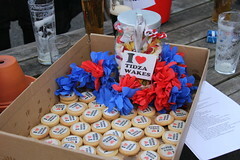 Item I Give and Bequeath unto my Daughter Hannah Thompson the Sum of One Hundred and Ninety Pounds Sterling. I Give and bequeath unto my Grandaughter Elizabeth Thompson the sum of Ten Pounds to be paid by my Executors into the hands of Humphrey Thompson her Father for her use. Item I give and bequeath unto my Grandson Samuel Haynes the sum of Fifty Pounds. I Give and Bequeath unto my Grandaughter Hannah Haynes the sum of thirty Pounds. Item I Give and Bequeath unto my Daughter Mary Foxlow the sum of One Hundred and Sixty Pounds. I also give unto the said Mary Foxlow a Box that was her Mothers Six Silver Tea Spoons a Silver pair of Tongs all my China Ware the bed she lyes on with all the sheets Blankets and furniture thereunto belonging. I Give and Bequeath unto my Grandson William Foxlow the sum of Ten Pounds to be paid by my Executors into the hands of his father for his use And I do hereby direct that the several Legacys and Sums of money above mentioned shall be paid in Twelve months next after my Decease. I Give and bequeath unto my sister Mary Platts the sum of Two Guineas to be paid in one month after my Decease. I Give and Bequeath the sum of Thirty pounds to be paid by my Executors at such time and times and in such manner and form as they shall think proper unto or to the Use of my Daughter Jane Smith but not to be Subject to the Controul Intermeddling or disposal of her husband John Smith or liable to his Debts And Whereas I have a Mortgage Security upon all that Messuage House or tenement with the Appurtenances situate in Winster in the Parish of Youlgreave belonging to the said John Smith husband of my said daughter Jane Smith and wherein she doth now Inhabit and dwell for Secureing to me the sum of One Hundred and Ten Pounds and Interest. unpaid ??? and amongst all and every of the Children of my said Daughter Jane Smith as shall be living at the time of her decease equally to be divided amongst them share and share alike And I do hereby further will and direct that when and so soon and as often as the said principal money of One Hundred and Ten Pounds shall be paid into the hands of my Executors that they shall Immediately place the same upon some other good and sufficient real security and shall pay and Apply the Interest thereof as herein before mentioned. And I do hereby order and declare that the receipt and receipts of my said Daughter Jane Smith shall notwithstanding her Coverture for the said sum of Thirty pounds or any part or parts thereof and for the said Interest moneys to be paid her as aforesaid and for every or any part or parts thereof be to my Executors and to each or either of them good and sufficient discharges for such payment and payments. Item I give and Devise unto my Daughter Joanna Ellis all that Messuage House or Tenement in Winster aforesaid and wherein the said Joanna Ellis doth now Inhabit and Dwell with all the appurtenances thereunto belonging for and dureing the Term of her natural life and from and after her decease I Give and Devise the said House or Tenement unto and amongst all and every the Children of my said Daughter Joanna Ellis as shall be living at her decease and to their Heirs and Assigns for ever to as Tenants in Common and not as Joint Tenants. Item I Give and Devise unto my Son Joseph Gregory and to his Heirs and Assigns for Ever all that Messuage Dwelling house or Tenement situate standing and being in Elton in the said County of Derby and wherein he the said Joseph Gregory doth now Inhabit and Dwell Together with the Outbuildings Garden and Appurtenances thereunto belonging. or thereabouts and commonly called and known by the Names of The Cliff Close Crosey Cliff Close Undertown Close and Pingle with a Barn standing on some part of one of them with their appurtenances which said last named Four Closes I purchased of John Dakeyne. Also all that my messuage or Tenement with all the Appurtenances thereunto belonging situate within the Liberty of Stanton in the said Parish of Youlgreave and wherein my said son William Gregory doth now Inhabit and Dwell and also all that my Messuage or Tenement with the Croft and Appurtenances thereto belonging at Ecclester in the Liberty of Stanton aforesaid now in the holding and possession of John Watts And also all that Messuage Dwelling house or Tenement with its Appurtenances situate standing and being in Winster aforesaid and now in the several possessions and Occupations of George Wall George Boam and Thomas Hawthorn. or in case I have not an Absolute and Compleat Title thereto then all my Mortgage Title thereof and thereto and the money thereon due and to become due which said last mentioned Messuage Dwelling house or Tenement was Mortgaged to me by Thomas Lea deceased. And I do hereby Nominate constitute and Appoint my said Two Sons Joseph Gregory and William Gregory Joint Executors of this my last Will hereby revoking all former Wills by me made In Witness whereof I the said William Gregory have to this my last Will and Testament wrote upon Three Sheets of paper to the first Two Sheets thereof set my mark and to this the Third and last sheet thereof Set my mark and Seal the Eigth day of January in the year of our Lord One Thousand Seven Hundred and Eighty Three. Let a Probate of this will be Granted to William Gregory one of the Executors named therein – a ?????? being ??????? for Joseph Gregory the other Executor to prove in like manner. The said William Gregory being then duly sworn before me. 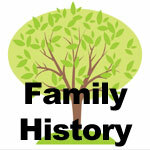 My Cousin Mark Allen has been working on the Gregory Family Tree too. He has managed to get hold of some very old wills from some our most distant ancestors…seems we had money, YAY!!! 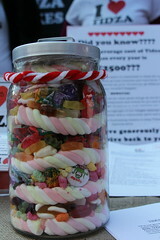 Shame there’s none left, lol. Anyway, Mark has relayed some of the info in the wills to me and they make for interesting reading. I’ll have to check out the copyright laws before I can post the details here but they are quite revealing. One thing that we did find out was that, William Gregory of Youlgrave b 1703, and his Wife, Hannah(nee Holehouse) Were moving between Ashover and the Youlgrave area quite a bit, as some of their children were born in Ashover and some in Youlgrave. As most of you know, we are still searching for Williams Father, James/Jacobus. I found a James Gregory in Duffield but no evidence to say he is ours. The Baslow link seems to have gone cold as the James Gregory born there seems to have died way too early to have been our guy. Someone out there has the key to this mystery. Well, we are pretty much back to these two again in the hunt for the long lost James/ Jacobus Gregory. Here are the two most likely suspects. Thanks to my Cousin Mark’s excellent detective work we can see that James ‘ son William was living around the Youlgrave area, but was too-ing and fro’ing between there and Ashover. 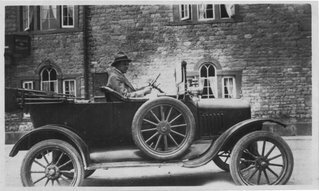 So, I’m seeking Gregory info about Duffield as I reckon that might be the most logical place sort of enroute but who can tell, theories welcome. 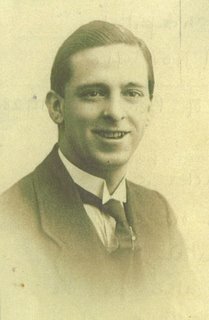 I know this isn’t Armistice day, but with it being the 90th anniversary of the Somme, I thought I’d point people to a website that has lots of detail about the Tideswell men who gave their lives in 2 world wars. The “Roll of Honour” Website has made a fair start at providing a little personal information about the Tideswell lads who never came home. Perhaps you know someone who lost a relative, perhaps you have some old family photographs or a service record that could be shared with the wider public? If so, please free to contact me. 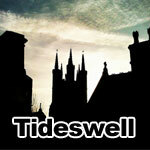 I’d love to hear from anyone with interesting Tideswell Service records data. My relative, Charles Gregory name is on the Tideswell War Memorial, Here is some info about Charles Gregory. Charles Gregory’s name appears on Tideswell War Memorial. Unit Text: 7th Bde. 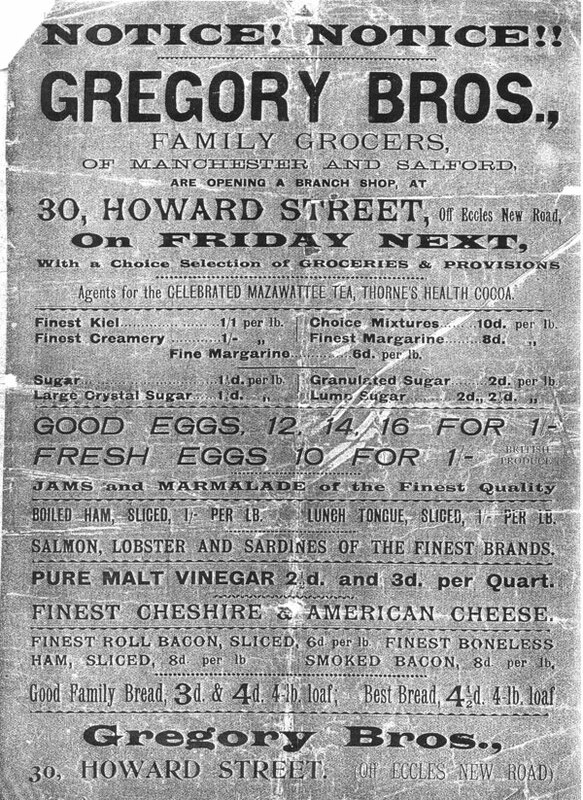 Ammunition Col.
Additional information: Son of Ben and Mary L. Gregory, of 551, Liverpool St., Seedley, Manchester. Native of Salford, Manchester. Grave/Memorial Reference: Div. 62. IV. A. 8. Charles was dreadfully unlucky to have died on the very last day of the war. Imagine getting through all that, just to check out on the last day? I’m keen to hear from any Gregorys hailing from the Salford Area of Manchester for more details on this man. 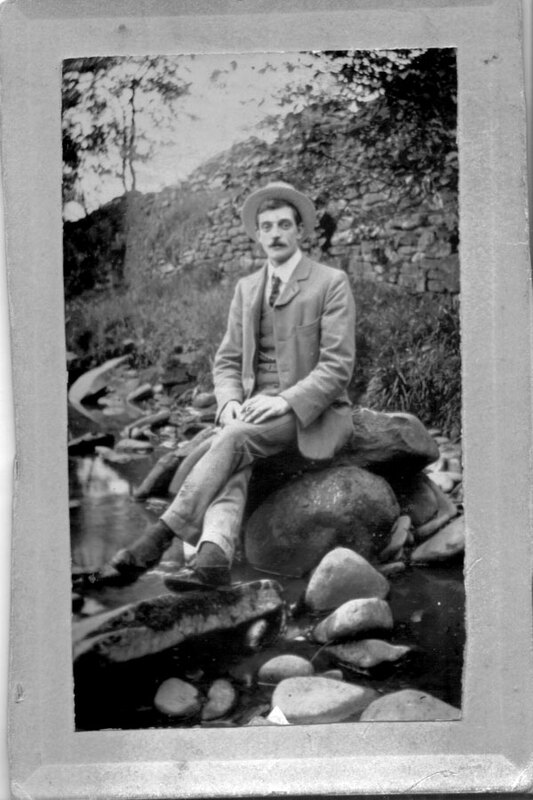 His father, Ben was the brother of my Great Grandfather Charles Herbert Gregory. I recently remembered that my mum’s Uncle Joe fought in the first World War. Both died at the Somme I think? I’ll look for more information on them. However, The BBC are some interesting material on the battle so here are a few links. Whilst some people still feel animosity towards the German people, I think we have to remember that they too suffered in the war. The ordinary men of Germany were simply doing their duty and following orders. The BBC site shows the feelings of two men descended from German soldiers of the Great War. I found this Brilliant World War 1 website the other day due to the Rootsweb Derbyshire-L mailing list. The site shows lots of background around the Ypres battles and shows some touching letters from soldiers back to their loved ones. 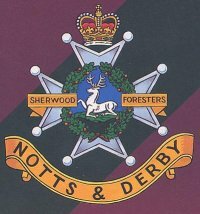 If you had a relative who fought in the Sherwood Foresters Regiment (Derby/Notts) perhaps you will find this of use. 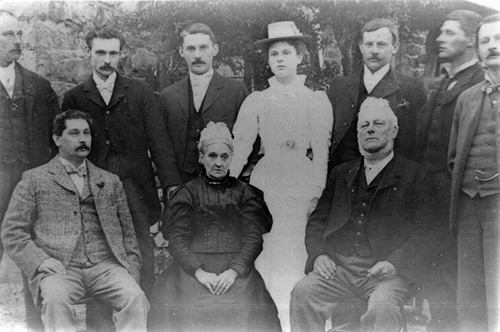 This family portrait shows most of the family around the 1890’s. I have no information about who took the shot or where it was taken. 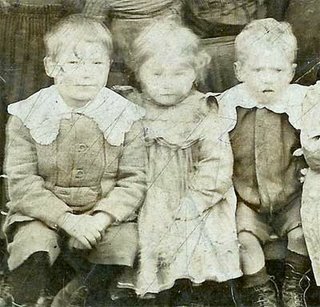 Charles Herbert is second from the left. 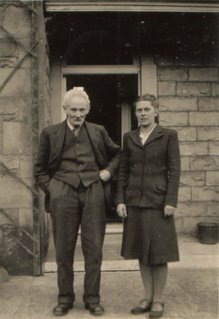 On June 25th, I went up to my Aunt and Uncles house in Tideswell, they had kindly allowed me to rescan some old family photos. I scanned some years ago, but lost the high quality originals to a computer crash. I re-scanned the old pics, plus a few I had overlooked before. These days I made a better job of it , so here are a few of the Gregory pics. Three of his children, Fred, Mona and Edwin Gregory. Circa 1905? 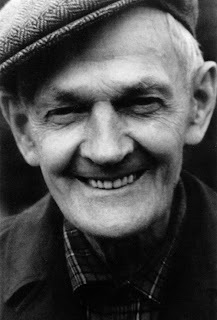 Edwin Gregory was my Grandfather. He had a keen skill for anything mechanical.This wonderful old photo shows a school class, I guess this would have been taken in the old school in Tideswell churchyard. 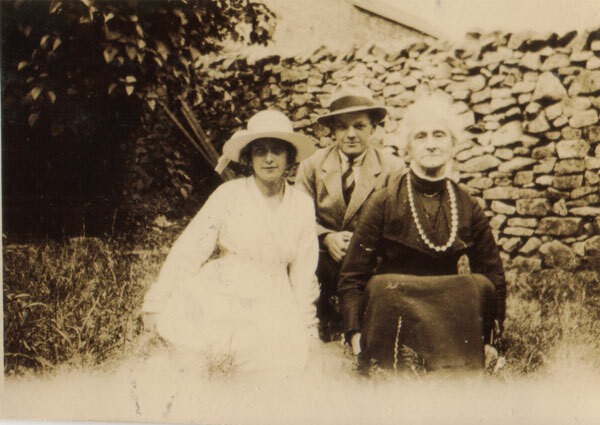 I cannot be exactly sure of the identities of the first two but we believe that they are Fred and Mona Gregory. Edwin Gregory Married Ivy Tomlinson from Chapel Milton, Chapel-en le-Frith. 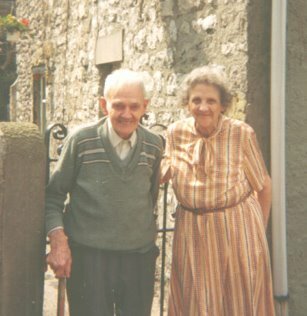 They lived in Tideswell until the 1990’s. Ivy was a keen Accordion player and could also play the piano, she enjoyed amateur dramatics too. They lived for a time at Town Head, Tideswell before moving to Pinfold, and then later to Sandford Cottage, Cherry Tree Square. Edwin was a brisk walker right up into his eighties.Even in his 90’s he continued to make model steam engines out of reclaimed machinery. All the models actually worked. John Palmer of the Wirksworth Website added these details of fines that Derbyshire people called Gregory picked up. Seems the law was picky back then too.